Winter activities in Southern Michigan can be as simple as a trip to the ice skating rink or as elaborate as a spa weekend. Cold winter months are a great time for a change of scenery and a time to relax or to go out and have some outdoor fun. Innkeepers of Southern Michigan Bed and Breakfasts have simple and detailed winter getaway ideas to help you with your plans for fun or romance. In Albion at Victory Park, located along the Kalamazoo River and 1 block from the Palmer House Inn, there is a wonderful hill that has provided sledding for generations in Albion. Every year on the third Sunday in January. 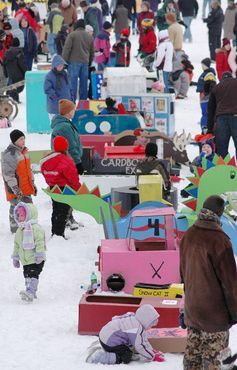 Albion holds a sledding contest on the hill sponsored be Premier Corrugated and World Corrugated Container. Anyone, young or old,with any kind of sled made with cardboard can enter. Past entries have been as elaborate as Cinderella’s coach complete with horses made of corrugated materials and as simple as a cardboard box. Entry forms are available at the Greater Albion Chamber of Commerce. For couples who cannot get away on Valentines weekend, a gift certificate for a future getaway can be used as a much appreciated gift for your lover. You can then alleviate your cabin fever when the timing is better and there is still snow on the ground. Individual Southern Michigan Inns offer gift certificates in any denomination. There is another 3 day weekend in February for workers who celebrate Presidents Day on Monday, February 21. In addition to the traditional Friday-Saturday night getaway, many Southern Michigan Bed and Breakfasts offer 3 night packages with special pricing for Sunday night. Bed and breakfast and fireplace and Jacuzzi tub and movie tickets and massage are nice combinations for winter getaway package ideas at the Munro House Bed and Breakfast in Jonesville. 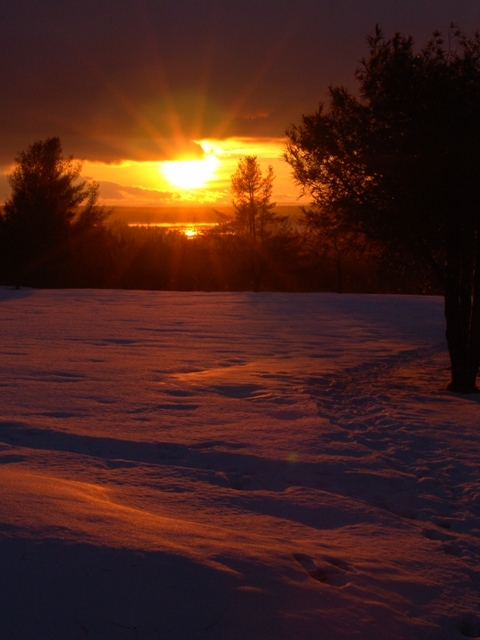 The colors of a wondrous winter sunset are a beautiful view from the rural property of Quigley’s Log Home Bed and Breakfast in Hudson. It is like a slowly revolving colorscape… a photographer’s dream come true. Later in the evening it is common to see up to a dozen deer as you go for a walk along their country road. The moon and the stars will reflect off of the snow and light your way on a romantic winter walk. A big cup of hot chocolate topped with lots of marshmallows and a relaxing time by the fireside can await you when you return to your hosts. January and February are wonderful times to getaway to enjoy the beauty of living in Michigan. This entry was posted in Winter and tagged Albion Heritage Inn, Gift Certificates, Munro House Bed and Breakfast, Quigley's Log Home Bed and Breakfast, Winter Getaway Ideas by admin. Bookmark the permalink. My favourite weekend getaway is still the Spa Weekend, during summer as much as during winter. But your other ideas with festivals, movie packages or just pure winter fun are very tempting as well.